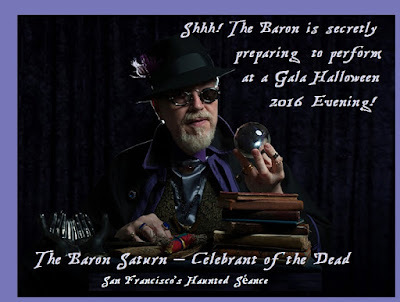 My acquaintance The Baron Saturn - Celebrant of the Dead, will be featured during a secret Halloween soiree! ...Unfortunately I have been informed the dark revelries have sold to capacity. But The Baron will reveal ALL when the curtain descends on this memorable Halloween! The Gala Event will materialize at an undisclosed site known only to the one hundred fifty attendees. The night will come to life with a sumptuous feast and wondrous festivities featuring magicians, musicians, dancers, dreamers, and a bevy of ethereal performance-artists. The Baron Saturn is very pleased to offer his services for this darkly elegant night. Shhhh ...DON’T say another word!